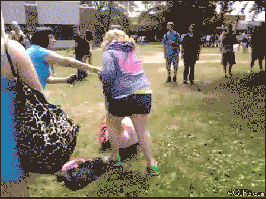 Here is a collection of the funniest animated gifs that I have come across on the Internet. Decided to put them all on one page, instead of making you click through multiple sections etc! Bear in mind that this is a work in progress, so if the list seems a little sparse, rest assured that I'll be adding more funny gifs as time goes on. Here's one where the cat is saying "And this is where I'd put my scratch post... IF I HAD ONE!" The way the cat suddenly turns its head is hilarious. I kind of feel bad for laughing at this one of a helpless elderly man being assaulted by a shopping mall escalator. This gif acts as a great analogy for when bad things get even worse. The utter destruction that is caused as he stumbles around on the threadmill while trying to get his footing is just brilliant. If there was a fail to end all fails, this would be it. We'd be able to put the word to rest and Internet connoisseurs would feel at ease. Not only is this poor guy unfortunate enough to trip over a clearly-visible chain, he's also completely unable to recover from embarrassment as the shelves of candy come crashing down on top of him. I'm honestly curious as to what people thought when they first saw him lying there. The randomness of him punching a passing woman while he casually sips on his morning coffee legitimately made me laugh out loud. This is from "Todd and the Book of Pure Evil" (2010). Somebody decided to edit some footage of a teacher pushing over a heavy-set student while she was attacking another girl in the playground. The result? "No Brenda, she's not food!" Fifa 13 is well known for its glitches and rag doll physics. 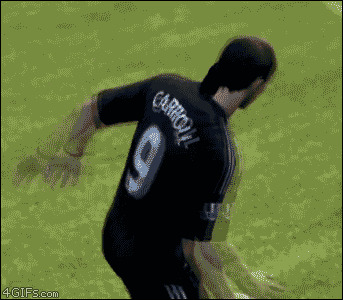 Still, this gameplay footage of Andy Carroll kissing a goalkeeper kind of caught me off gaurd! This is a strange-but-funny animated gif of a black pastor holding his arms out before he transforms into a fighter jet. LOL, so random! Holds up spork! This gif has all of my whats. Who decides to pull their pajama pants up over their shoulders before dancing around like a maniac? Evidently, this girl. 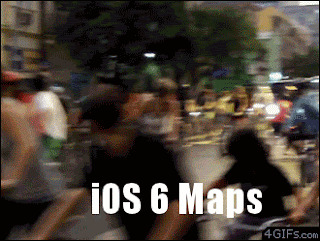 When iOS6 came out with a new map app, people weren't happy with its accuracy. For example, in Ireland; the app pinpointed Dublin airport as being in Dublin zoo. After millions of angry users unleashed their fury on Internet forums etc, gifs like these started to appear. Here's one of an unsuspecting boy receiving what looks to be a basketball to the face. Man, this dog has seen some things in his day... Queue flashbacks to Vietnam. An animated gif of a dog trotting along with a newspaper in its mouth. A perfectly-executed prank. 10/10. Poor guy. I just love the way this poor kid fails. Look at how graceful he is as he stumbles and falls flat on his face. You have to admire the owner's reaction speed. Don't try and play catch with somebody who has an eye patch!